Last edited by Kathie Fry; April 15th, 2008 at 11:32 PM. In SoCal, probably 90% or more of the rinks are gone. In the 70's when skating was most popular there were rinks everywhere. It used to be said around the rinks that Rollerskating, as a participant sport, was bigger than Baseball, Football, Basketball and Hockey combined. I don't know whether it was actually true or where they got their info but it seemed plausible. I don't remember the names of all the rinks that I have been to that are gone but I have included a partial list of cities where there were rinks that AFAIK are gone. Funny how there is a Memories thread and the first one to post is someone called "Nostalgic." irony-- no? As I said in another thread somewhere, our rink was destroyed in a tornado back in 1985. Would it still be there today and kicking? I think so. Because the other two local rinks are still going and they sucked in comparison. I guess fate has a sense of humor. I have a list of roller rinks from the 60's from all around the country if this what you are looking for. At one point, we had Three rinks in town. Gibson Arena- Still open, and I attend every session I possibly can there. They have a sister Rink (Same Owners Family) in New Castle Indiana. Basically, During the late 80's you either went to Gibson's or Skate-A-Way. There were a few of us that went to both. I stayed away from Skate-A-Way for the most part, as their floor ROYALLY sucked. Skate-A-Way Started having MAJOR management issues, and started suffering maintanence problems shortly after. They had a big hole in the floor for nearly 2 years, that got worse and worse, with nothing done about it. The building that housed Skate-A-Way is still standing but it is now a carpet store. The Old disco floor (Really just a raised 9'X9' lighted floor stage platform thingy) got sold to the local under 21 club, and was destroyed in a fire 2 years after the rink closed. I never skated at the Hullabaloo, as I was really REALLY little when it closed (Building is still there, but it is a storage warehouse now). There is Rumor that there is a rink in Gaston Indiana (Tiny little hole in the earth town a few minutes northwest of Muncie). But I have yet to get the inkling to even attempt going to that god-forsaken little town to see if it is true. I also had another Favorite Rink that was Located in Somerset Kentucky. I used to go there when my parents would take me to see my Great Grandmother and our Aunts and Uncles that lived in Mt. Vernon. I don't remember the name of the rink, but they had a REALLY nice wood floor that was well maintained. I haven't been down that way in about 5 years, so I don't even know if that rink is still there or not. It would be a shame if it has closed. Everyone there was friendly, they played GREAT music, and the floor was one of the nicest wood floors I had ever skated on. I might take a Drive to get photos of the locations, and the actual physical addresses of the Old Hulaballoo and the Old Sake-A-Way building to post up in here. I'll ask around to some of the other skaters around here and see if they have any photos from the heydays of the closed rinks. Outside, inside... whatever. have a list of roller rinks from the 60's from all around the country if this what you are looking for. Brikkee, it would be interesting to see that list. Do you know if most of those roller rinks are still open, or have most of them closed? WOW, in VA it is just the opposite, well at least in our are skating is making a come back. Of course my wife and I promote it alot in our area. Heck we talked with a few of our friends about building one. A nice big one, with state of the art light and sound. Plenty of staff to keep it up. We even found the perfect place to build one. But The Fun We Had There And The Friends I Have From There. I'ts Tore Down Now And I Only Have A Few Pictures. God!!! I Miss That Rink. And It Was Owned By Lou And Bud Meyer. Father And Son. 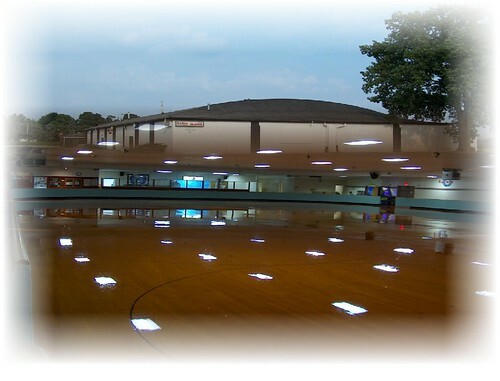 When we still lived in the Philadelphia Area (in the early 70's) My husband and I met and skated at Pike Rollarena, South Hampton Pa. Any one else ever skate there??? Bill Clark was the Organist, but, about the time I started skating he was leaving to open his own rink. Shortly after my husband and I were married Marty Dumic arrived at Pike to play the Organ!!! OMG ... we were all so young!!! I think Marty was about 20 years old and we were in our 20's too! Pike was not a large rink, but what a "FUN" Rink... The "Fleahoppers" skated 2nd session on Saturday nights and that is what impressed me the most since I was a "newbie". There was a bunch of us haridressers that worked together and decided that we needed something "different" to do on weekends... It all started out as a joke but it didn't take long for 3 of us to become addicted!!! After all... we got all the help we needed to learn how to skate. Imagine a group of 7 or 8 Hairdressers, with "Big Blond Hair" and "tiny little Hot Pants"... The guys were tripping over each other to "help us learn"!!! hahaha...LOL.... Oh what memories!!! We were all just stunned when we started skating on Sunday evenings too... That's when the Artistic skaters showed up... And that's when I met my husband! The memories are wonderful... the Christmas Party at session when our Son was "Rudolph"... the Junior level Dance Team that did the Flirtation Waltz and then the Continental. And then the few of us that were in the Adult Skate Class fumbling thru the Glide Waltz in our funky looking costumes!!! But it's all great memories from a rink that "used to be". Let's hear some more memories!!!!!!! Looking on the pages you posted, I recognized the listings for Cleveland Ohio. The Rollercade on Denison and Puritas Springs rink I remember my father telling me about them. They are both gone, I never got a chance to skate there. Janesville Wisconsin had a rink called Skatin Place and that closed last year it is now a Banquet Hall. Skate ranch, skate depot, skate garden, skateway, skatopia, and a few more I cant remember the names of. Skateway had 3 or 4 rinks spread around socal I think. I believe there were over 50 in the LA/OC area in the mid to late 70s, and maybe 25 left by the mid 80s. In the 80s there was one dirty word invented in the skate industry, "Rollerblades" lol. My father and Grand Father both worked at Euclid Beach Park on the east side of Cleveland. The used to spend alot of time at the roller rink there as well.